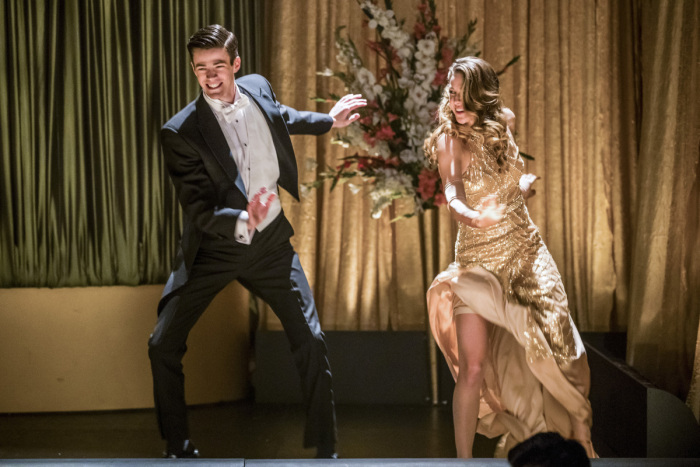 The Flash -- "Duet" -- FLA317b_1080b.jpg -- Pictured (L-R): Grant Gustin as Barry Allen and Melissa Benoist as Kara -- Photo: Jack Rowand/The CW -- ÃÂ© 2017 The CW Network, LLC. All rights reserved. Like Barry and Kara, I love musicals. Like Barry, my love was introduced via a parent. For me it was my father, for Barry his mom. We learn this fact when we see Nora and young Barry watch Singin’ in the Rain. In the present day, we see Barry watch the Gene Kelly musical over and over again to get over what happened between him and Iris. The Flash — “Duet” — FLA317a_0147b.jpg — Pictured (L-R): Chris Wood as Mike, Melissa Benoist as Kara/Supergirl and David Harewood as Hank Henshaw — Photo: Katie Yu/The CW — ÃÂ© 2017 The CW Network, LLC. All rights reserved. Barry’s funk is interrupted by Cisco who alerts him of a distress signal from HR. When the get to STAR Labs, HR lets them know someone is coming through the breach. Cisco thinks it is Gypsy but are surprised to see that it is J’onn and Mon-el who is carrying an unconscious Kara. The Flash — “Duet” — FLA317a_0178b.jpg — Pictured (L-R): Carlos Valdes as Cisco Ramon, Grant Gustin as Barry Allen, Candice Patton as Iris West, Tom Cavanagh as Harrison Wells, Chris Wood as Mike, Melissa Benoist as Kara/Supergirl, Danielle Panabaker as Caitlin Snow, and David Harewood as Hank Henshaw — Photo: Katie Yu/The CW — ÃÂ© 2017 The CW Network, LLC. All rights reserved. J’onn and Mon-el explain to Team Flash what happened at the end of last night’s Supergirl, which is an alien prisoner (the Music Meister) whammied her and took off to Earth-1 in search of Barry. No one knows why but Mon-el wants to find the Music Meister to reverse whatever has been done to Kara and wants to be the first one to punch. Barry wants to know who Mon-el is and he explains that he is more than friends with Kara. Caitlin didn’t realize that Kara had a boyfriend and J’onn brings up the fact that they broke up towards the end of Supergirl’s “Star-Crossed” episode. Cisco goes in search for the Music Meister but doesn’t have to go too far as he is in the speed lab. Barry and Wally arrive in their speedster costumes but the Music Meister knows their real identities. The Music Meister, possessing super speed knocks Wally out of the room and grabs Barry before he can attack him and then whammies him. When Barry comes to, he is in the same 1940s club setting that Kara entered into last night. Barry sees Kara sing “Moon River” and she spots him. After Kara sings her lovely rendition, both are surprised to see each other and don’t know where they are. Barry and Kara are then confronted by Malcolm Merlyn but this isn’t Merlyn but Cutter Moranz, owner of the nightclub and the boss of Barry and Kara who are singers in his club. Moranz comments on Kara’s singing and then asks Grady to help her out. Grady turns out to be Winn and the busboy of the club is Cisco. Barry and Kara are still confused and this is when the Music Meister appears and tells them they created this world because of their love of musicals. They are in this world to learn a lesson and the only way out is to follow the script of this movie musical they created. Just before the Music Meister leaves, he gets the musical started with a song and dance number set to “Put a Little Love in your Heart” and sung by Winn, Cisco, Merlyn and the Music Meister. When the number is over, Barry and Kara are confronted by two armed men who knock them out. If you are wondering why the two don’t use their super powers in this world, well the two don’t have them. The Music Meister did warn that if they died in their movie musical they die in the real world. When Barry and Kara come to, Barry mentions how her boyfriend seems to care about her. Kara says Mon-el is no longer her boyfriend and they broke up because he lied to her for 9 months. Kara tells Barry that she thought she found someone and have a life like he and Iris. Barry has to tell Kara that he and Iris are on the outs and that he proposed to her for the wrong reasons. Their conversation is interrupted by Stein but it isn’t Stein. We never find out what his name was in this universe so I am just going to call him Stein for the purpose of this recap. Joe who isn’t Joe walks in and introduces himself as Digby Foss, a gangster in these parts. Digsby is enlisting Barry and Kara’s help to find his daughter Millie (who is Iris) as she has been frequented Moranz’ (and rival gangster) club. With Cisco/Pablo’s help, the two track Millie to an apartment. When the two hear screams the kick the door down, they see Millie/Iris making out with Tommy/Mon-el, who is the son of Moranz. When Kara sees Millie/Iris and Tommy/Mon-el make out she says gross. Considering this is a musical, they figure part of the story is to get the two love birds to confess to their father’s of their love. And it was just that easy as Millie and Tommy agree to tell their dads the truth of their star-crossed love. The Flash — “Duet” — FLA317c_0544b.jpg — Pictured (L-R): Candice Patton as Iris West, Victor Garber as Professor Martin Stein and Jesse L. Martin as Detective Joe West — Photo: Jack Rowand/The CW — ÃÂ© 2017 The CW Network, LLC. All rights reserved. Millie goes to tell her dads (Barry is surprised to hear that). The two dads accepting their daughter’s choice in beau and thanks her for being honest. The two serenade her with “More I Cannot Wish You” from Guys and Dolls. When Millie is confessing, Barry realizes that her standing up to her father for her love make him realize how strong Iris is. Barry mentions Millie’s strength to her fathers which is what convinces them to accept her beau. At the club, Tommy confesses to Moranz about Millie and apologizes for lying to him. Moranz isn’t happy at being lied to but Kara jumps and defends Tommy saying that he should see his son’s side of things and there is a reason that he lied, which was his reaction to the news. Moranz also sings “More I Cannot Wish You” joining Joe and Stein. When we think all is well, both gangsters ready their men for war. I really do love that song as it is one of my favourites from Guys and Dolls and I thought all three men sang it well. The Flash — “Duet” — FLA317b_1109b.jpg — Pictured (L-R): Grant Gustin as Barry Allen and Melissa Benoist as Kara — Photo: Jack Rowand/The CW — ÃÂ© 2017 The CW Network, LLC. All rights reserved. Back at the club, Barry and Kara are getting ready to perform. With the help of Grady/Winn, they perform an original tune “Super friend” penned by Rachel Bloom of Crazy Ex-Girlfriend fame. The song had some clever lyrics but other than that I thought it was just okay. Meanwhile, back in reality, Caitlin determines the Music Meister has stolen Barry’s and Kara’s powers. The Music Meister uses it to rob the Central City bank. Cisco and Wally are ready to confront the Music Meister and J’onn wants to join. Cisco doesn’t think it is a great idea until J’onn unveils his Martian Manhunter guise. When the trio breach to where the Music Meister is, he starts to taunt Wally about being affected by Savitar. The Music Meister and Wally then race each other. Cisco breaches J’onn to knock the Music Meister while he is airborne and opens another breach for Wally to knock him on the ground. The plan works and the Music Meister is knocked out. When the Music Meister is placed in the pipeline, Iris and Mon-el wants him to get their loves out of their coma. Music Meister says he can’t and it is up to Kara and Barry. However, Music Meister asks Iris and Mon-el if they love them enough to help them get out. Back in the movie musical, after Barry and Kara finish their performance, they hear gun shots from the rival gangs. The two rush out and Barry and Kara get caught in the crossfire. In the real world, Barry and Kara’s vitals are going haywire. Iris asks Cisco to vibe her and Mon-el to whatever world they are trapped in. It works and Iris rushes to Barry and Mon-el to Kara. Iris declares her love to Barry and he reciprocates. The two kiss and both return to the real-world. Kara forgives Mon-el for lying to her and they kiss and go back to the real-world. Once awake, the Music Meister has broken out of his cell and tells the two that he saw the two were broken-hearted and wanted to teach them a lesson about love. The Music Meister then disappears. At the cortex, Cisco can’t believe they were trapped in a movie musical. Barry and Kara compliment each others singing. J’onn then tells Team Flash that it is time for them to go back to their Earth. Before they leave, it looks like Kara and Mon-el are back together as the two kiss and she threatens to drop a mountain on him if he lies to her again. Phew, I am glad that their break-up didn’t last very long as again I really love Mon-el and Kara. As for Barry and Iris, those two kids will be just fine too. When Barry and Iris go back to their apartment, Barry sings to her a song called “Running Home to You” and it is actually beautiful and Grant Gustin sings it very heartfelt. At the end of the song, Barry proposes and Iris says yes! The song writers for that lovely ballad are Benj Pasek and Justin Pa, the Oscar-winning due behind “City of Stars” from La La Land. When I first heard that their was going to be a musical cross-over with The Flash and Supergirl I was skeptical and thought it was off-brand for both shows. When I heard the villain was going to be the Music Meister then that gave me some hope. But as we were leading up to this episode, I actually got excited to see it. I did like the fact there weren’t that many musical numbers and having it take place in a movie musical made sense. Some parts were too on the nose like Kara realizing why Mon-el lied to her but overall I thought it was silly fun and great to hear the talented cast of both shows sing their hearts out. Would I want to see another musical episode? I am not quite sure about that.